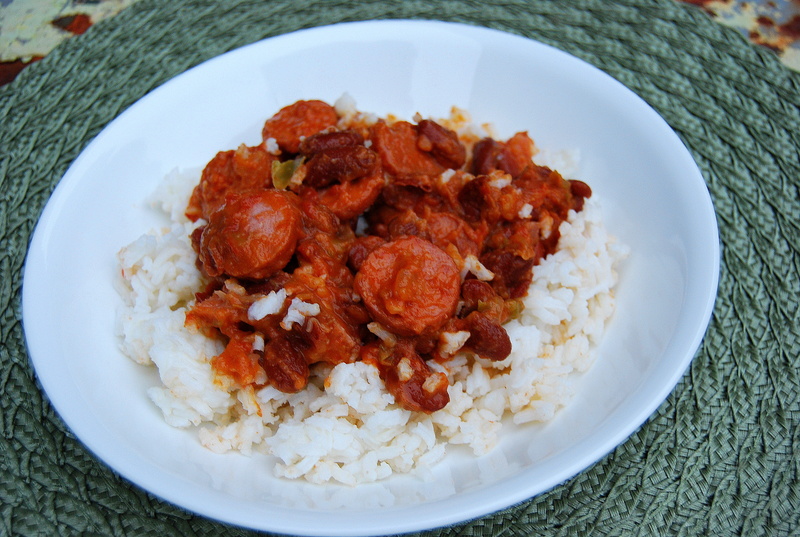 I revisited my mom’s Cajun-style red beans and rice recipe last weekend; we had a little cool snap and I thought it would be tasty to pull that together to enjoy with the boys on a cool night. I still have my mom’s handwritten recipe for this recipe. I am not sure whether she copied it from a Southern Living magazine (it was her favorite) or if she just made it up. I love, now that she’s gone, looking back on things she’s written. Seeing her scrawly handwriting makes me feel close to her for a moment. Anyway, I love this recipe that she made frequently for our family during cold months. I replaced the smoked beef sausage with a much lighter turkey smoked sausage. I used canned beans which I rinsed instead of using dried beans to save time. To make it even healthier, you could serve it over brown rice instead of white. It would be just as delicious and would give your family an extra boost of fiber and nutrients! In a Dutch oven or deep frying pan, place one tablespoon olive or canola oil, and allow it to warm. Add onion and bell pepper. After two-three minutes, add the cayenne pepper, garlic, sliced sausage and cubed ham. Saute for 4-6 minutes, stirring occasionally. Salt and pepper to taste. Serve over rice. Tip: In your store’s freezer section, you can now buy frozen bags of rice that steam in four minutes in the microwave. It’s a great time saver! Also, my dad always ate his with Louisiana hot sauce sprinkled over the top. He liked more heat than mom did. Want to see a couple more Cajun-influenced recipes? You might like Crawfish, shrimp or crabmeat pasta, or Crawfish enchiladas. 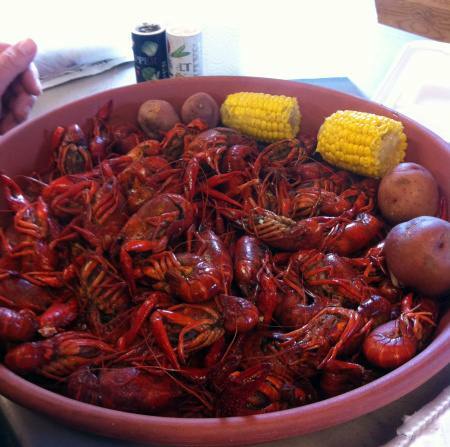 Better get your fresh crawfish while you can! Previous Post Can balsamic vinegar say I love you on a day like today?